Push notifications are no longer just about breaking news, weather, or traffic alerts. The newest—and arguably fastest-growing—channel for directly reaching customers has the potential to benefit both consumers and marketers. 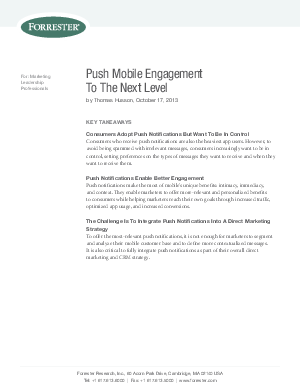 In this October 2013 report, Forrester Research, Inc. says push notifications are the ideal tool, combining the unique benefits of mobile marketing: intimacy, immediacy and context. Push messaging enables marketers to offer more-relevant and personalized benefits to consumers while helping marketers reach their own goals through increased traffic, optimized app usage, and increased conversions.